Valet Parking is available during dinner service. 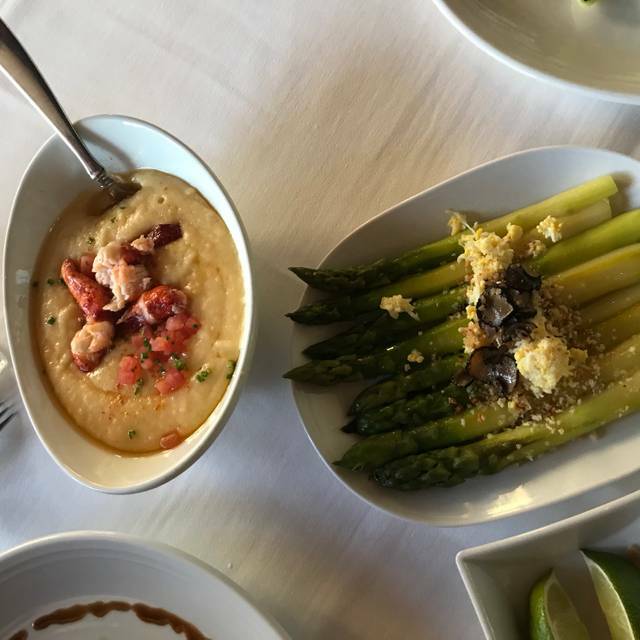 When you walk into M Restaurant, Cameron Mitchell’s marquee restaurant & bar, you understand. You are not just out on the town. You are in another place entirely — South Beach, perhaps. You’re surrounded by beauty. A lovely perspective of Downtown Columbus. An outdoor terrace overlooking the Scioto riverfront. Light woods and luxurious fabrics. 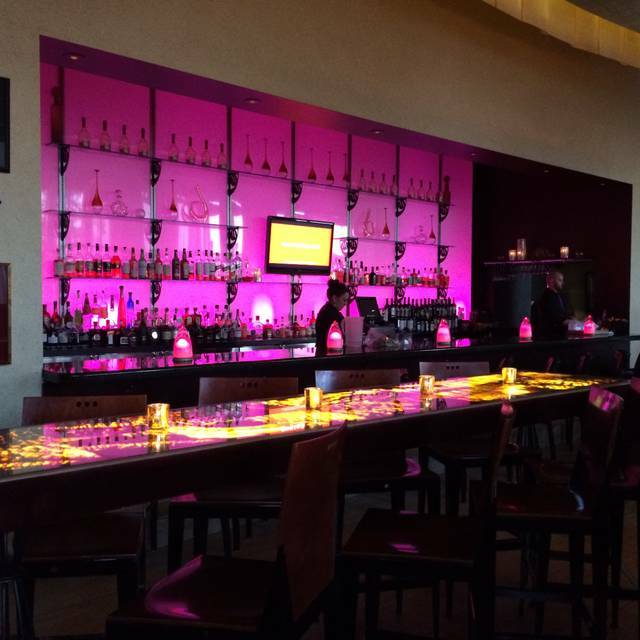 A dramatically lit bar. Artfully plated dishes of eclectic American cuisine, influenced by the assertive flavors of Pacific Rim & Europe. 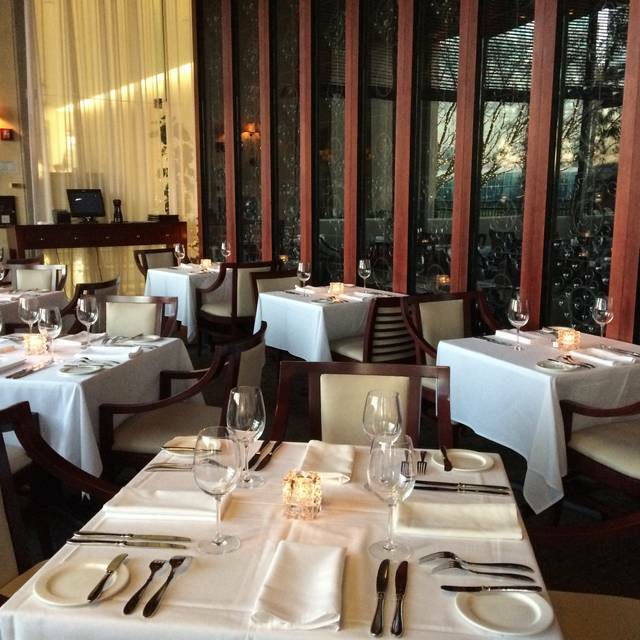 All enhanced by impeccable service and a wine list considered one of the nation's best. Excellent as usual -our favorite restaurant in Columbus. We always have a wonderful dining experience at M’s. 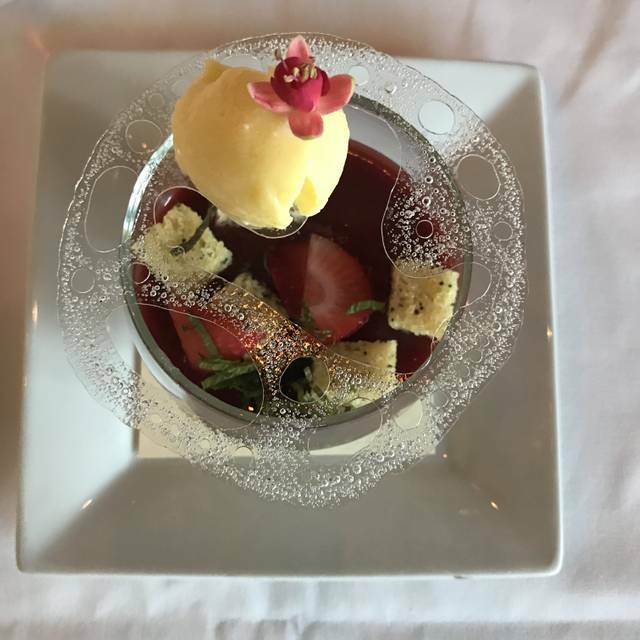 From the cocktails to the desserts and everything in between, it is always perfect! I always enjoy starting off with a Black orchid cocktail which I highly recommend! You won’t ever be disappointed with anything you order! Cannot wait til the next time I go! Amazing food with a great wine selection. Courteous staff and a great location. Great restuarant; delicious food and fantastic service. Had the king crab appetizer and lobster entrée. Both excellent. Food, service and ambiance were great!! The Chilean Sea Bass was amazing and Caleb is a fantastic server. This experience was wonderful. The staff was very accommodating to one of our diners who is blind, and added a note to our reservation to serve the food in a way that was easy for them to eat. I cannot day enough wonderful things about the restaurant and their team. They allowed a guest to eat with dignity and didn’t make him feel any different than other diners. Thank you! My boyfriend and I love Cameron Mitchell restaurants and we have so much respect and admiration for Cameron Mitchell, but this was our least favorite CM restaurant. My boyfriend ordered fish after server said it was very popular and had been on the menu for years. We each had 1 bite. It was not good tasting at all and was "fishy" tasting. The fried shrimp appetizer was very good! My steak in a bowl was decent but doesn't touch Jeff Ruby's or J. Gilberts. We love Cameron's Bistro - the Walleye is AMAZING!! I like Cap City and we're trying his new restaurant Del Mar opening this week. M just didn't have that classy, upbeat with a flare we like! We thought the environment was "stale." Felt like we were in banquet hall of a hotel. Just wasn't our thing. And the menu wasn't appealing to us like other CM restaurants. Also tried Hudson 29 a couple weeks ago. Good food. Loved the atmosphere. Felt like we were sitting in a restaurant while on vacation! Spent $500 for three people. Most expensive meal of my life. It was worth it, but it was not a good value. Couple details for M I think we missed but didn’t damper the experience. Valets should come to car with umbrellas Sat. Was a monsoon and I had to find my own umbrella and then deal with it inside the restaurant. Occasion was bday in the open table reservation but not sure the server would have even known if we didn’t mention at the end. The food was good. The service (hostess greeting was lack luster and cold and the waitress was pleasant but not exceptional). When I dine, I think of the 5 senses and this experience did not leave me feeling warm. It had been several years since we have been to the M so decided to go back. This time things have really changed and not for the best. The drinks were not constant at all. My steak was under cooked as well as the guy at the table by us. I chose not to send it back as my wife would have been finished by the time it came back or her food would have been cold. At the end of dinner and after sitting we ended up having to go find someone for our check. Last time for us there I hope this is not a indication of the other Cameron Mitchell Restaurants. Their overall service and the quality of the food and drinks are outstanding. Very nice ambiance and friendly and efficient staff. It would be nice if they introduced more vegetarian/vegan options, but we asked and they can accommodate requests. Perhaps they could include them in the menu in future, as the tortellini were delicious. Valet parking is available. 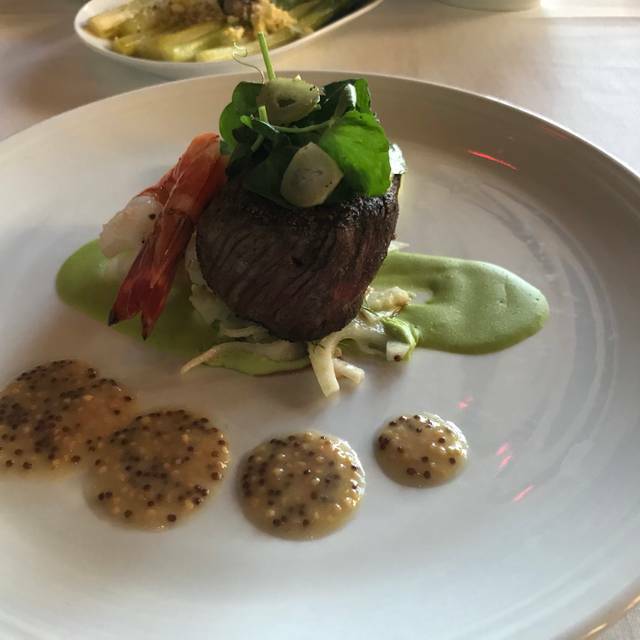 We will definitely eat there regularly, as this is a perfect restaurant for fine dining, in a good location with a nice view and with great atmosphere. The Food and the service was outstanding! No complaints! My lamb was cooked medium. I ask for medium rare. I didn’t say anything, Not sure why. Our coffee never got refilled, our wine rarely got poured, and our water was slow to get refilled. We've been to M probably 6 times over a number of years. Our last two visits were big disappointments, the last one the worst. I used to tell people it's the best restaurant in Columbus, won't do that anymore. The meal was just not up to top of class restaurant standards and we've been to some great restaurants. under seasoned, sauces with no flavor, to be honest could cook what we had at home better ourselves for a lot less than the $150 bill we had that evening (wine not included). It's not the ambiance or service per se, it's that the food does not live up to the standards of the prices they charge and the standards for a fine restaurant. I would also say that, in our view, they are very stuck menu wise. it has not changed over the years, it's not a bad menu but you'd expect some innovation. when you see that in a restaurant it's usually a bad sign. Great restaurant, great food, and great service This was our first time here, and we were celebrating our 13th Anniversary. Linda, our waitress was so welcoming and gave us the attention that we needed for first timers. The food was of great quality and well priced. We will definitely recommend and come again. Excellent place to dine! Great experience. Great food. Love the menu! Love the service! Love the view!!! Great food and crafty cocktails, this place is worth it. I had the rack of lamb with the caterpillar sushi appetizer and I was very pleased with everything. I will be returning here as it is a perfect spot for date nights or special occasion dinners. It’s located in a pretty quiet spot I honestly didn’t know if I was in the right place when I pulled up but I found this to be a positive thing because there was no headache about pulling up to the valet or dealing with traffic. I’ll definitely return here! Dining at M is an excellent experience. 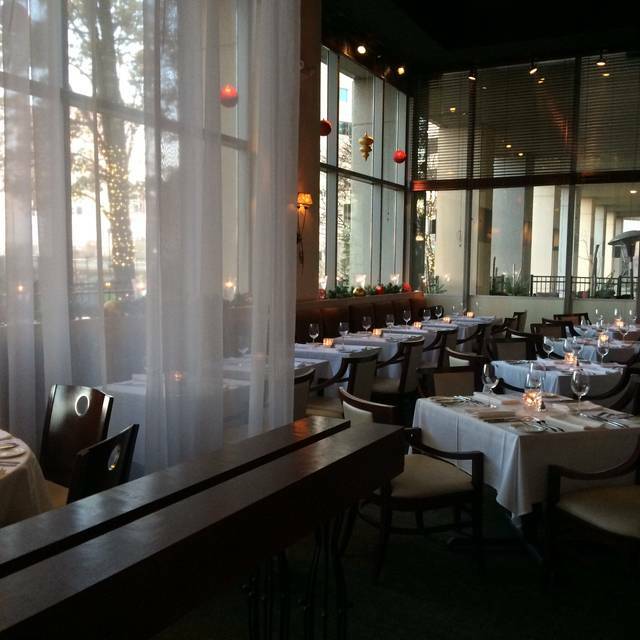 Both the ambiance and service are second to none in our view. were quite limited and only 1 kind of soup. However, that's tempered by the fact that our server Vince was able to accommodate both of us with some things not on the menu. Second, in our opinion the food portions were too small. My wife's mashed potatoes, my Duck entree and vegetable could have been larger. 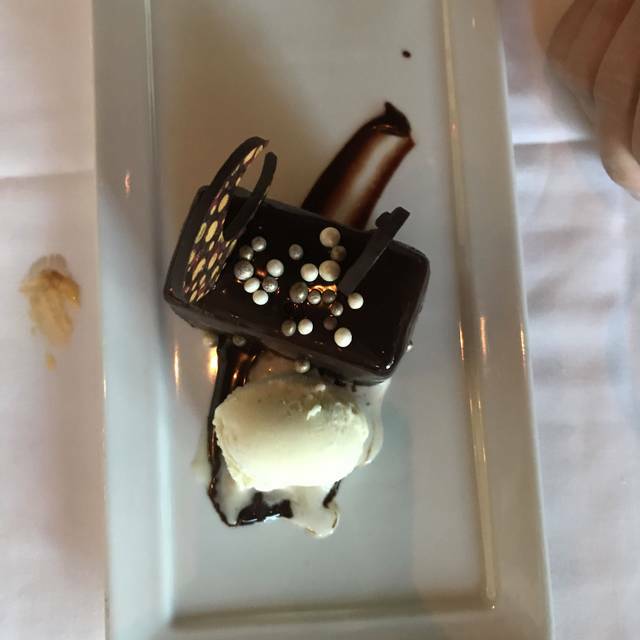 Even the triple chocolate desert was rather small, but to be fair, it was taken off our bill in honor of our forty-fifth anniversary. Nonetheless we would make a return visit anytime possible. M is terrific! I’ve always given M rave reviews. My overall visit was really nice. Our server was very attentive and polite. My entree was the duck and my shareable sides were the asparagus and macaroni and cheese (not with lobster) my date’s entree was the NY strip steak. My food was cooked how I requested but was luke warm the sides were luke warm as well. I assumed it was due to the restaurant being really busy (Vday weekend). I loved coming here for something special but have to say this was the first time I was let down. It seems to have lost its sparkle for me and can’t say I’ll ever be back. My date and I were stuck at a little table in the corner next to the freezing cold window and my seat on the booth side had a huge dip in it causing my back to hurt. The service was just ok not above and beyond like many other times. The food was mediocre and forgettable. I saved room for desert but what I wanted had been removed from the menu. Overall pretty disappointing for a special occasion. For the price and what I was expecting from the past it just doesn’t do it for me anymore. Saturday 02/16 was my first time at the M. It was better than expected. My server Marshal was the highlight of my visit. He was very professional, very honest, and made my visit very enjoyable. The meal that Marshal recommended to me was very filling and tasted very good. The drink that he recommended was even better. I plan on visiting the M again very soon. The food was amazing. I got the steak bowl and ate every bite. My date got the lobster mashed potatoes and loved it. 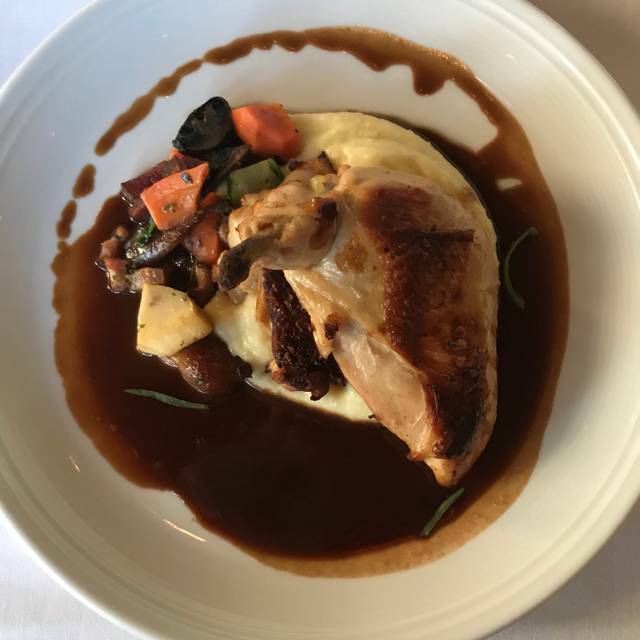 We've always really enjoyed the food at M. It's a bit pricey, but mostly worth the cost. The cocktails, IMO, are over-priced a bit. But everything else is about right. For some reason, this last time, our service was slow. We probably waited 45 minutes between apps and mains. But it was packed, to be fair, since it was the weekend after Valentine's. Everyone was friendly to us, and the food was perfectly prepped. Never disappoints, although we're very happy to learn that the restaurant is about to be updated and refreshed. No matter how good the food and service, if the setting is tired and worn, the overall experience comes up a little short. Linda has been our server more times than we can count - we always ask for her - and as always, she was delightful, knowledgeable and helpful. M and the Guild House are without doubt the bright stars in the Cameron Mitchell constellation. M never disappoints. My wife and I go for most special occasions. She has multiple allergies and the chef and staff is beyond accommodating to make sure she has an excellent safe experience. Hostess and waitstaff were friendly, pleasant, and informative. Our waiter was respectful of our space and we never felt rushed even when the place became filled. It was hard to chose from the menu because everything sounded so good! I ordered the duck and my wife ordered the lamb. We’re not big eaters and we found the portions perfect for us (some may want more). Our meals were absolutely delicious... I commented to the waiter that I’ve never had duck that seemed properly prepared. He was so confident in their duck he offered to replace it if it was not to my liking. It did not disappoint. Overall a very nice place to eat. The portions are a bit small, and while perfect for us, may be too small for others. The bill was a bit high, but then again, we feel we got what we paid for... outstanding food and great service! Best cocktails (and bartender) in Columbus. Our server, Liza, was incredible. The service and atmosphere never disappoint here. The food portions are smaller than most restaurants, but the flavor, presentation, and quality cannot be beat. This is one of our favorite restaurants in all of central Ohio. 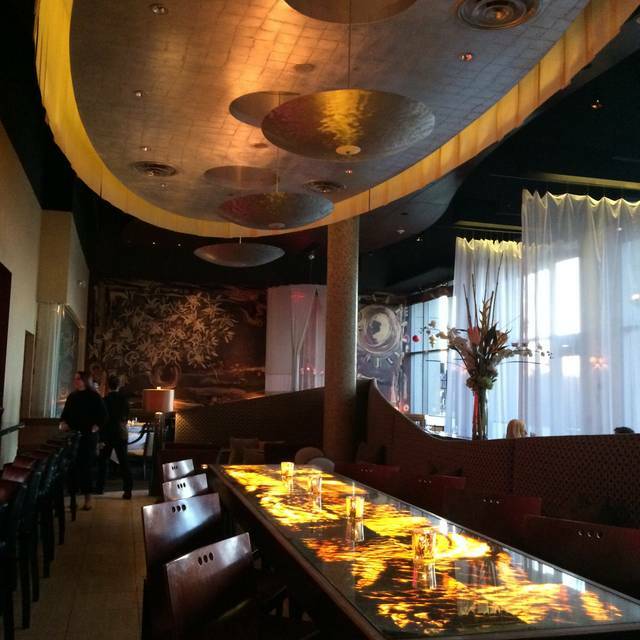 The ambiance is awesome, the food is even better, and we are never disappointed!! !